In the pre-dawn hours on a spring morning, there is a beautiful symphony of sounds that I hear when my mind is quiet enough to listen. Even before the sun comes up, nature has begun to speak. So many birds are singing on these crisp spring mornings. There are the high-pitched tones, the slow deeper rythmic calls, the intermittant chirps and buzzes. The horses join in the music with their footsteps, their snorts and their soft munching on the grass or hay. The wind often plays a part in the music – causing the tree branches to creak or new spring leaves to rustle. A cat will occasionally walk by and the pack of dogs in the house will contribute to nature’s peaceful song with their own barks and howls. Some days, I hear the symphony in every detail, every phrase and transition. Other days, I am deaf to it all, my mind racing with the pressures of the day ahead and with loud thoughts that drown out the music. Thankfully, this morning I was present in nature and heard the beautiful pieces of music. Today, we said good bye to our dear sweet Oaka – our 25 year old blind former PMU mare who lived a hard life before coming to us but emerged from the PMU lines with a courageous, gentle and kind spirit. This morning started out beautifully. After weeks of bone chilling cold, and after a violent night of thunder and lightening, the day awakened with a warm spring breeze and the promise of sun and temperatures finally reaching the 80s. This would mark the first true spring day of the year. The horses could sense the pleasure of the day ahead as they danced about a bit more than usual at morning feed time. All except Oaka. This morning, Oaka was laying in sternum position in her stall, alert and waiting for her breakfast. This was a warning sign as, in the six years that we had owned Oaka, other than foaling time, she never went down in her stall. Oaka was hungry though and quickly gobbled all her hay and grain – but she would not stand up. Two vigorous tries to pull her to her feet failed and I quickly called the vet. The next several hours involved attempts to get Oaka to her feet. She was not able to stand. 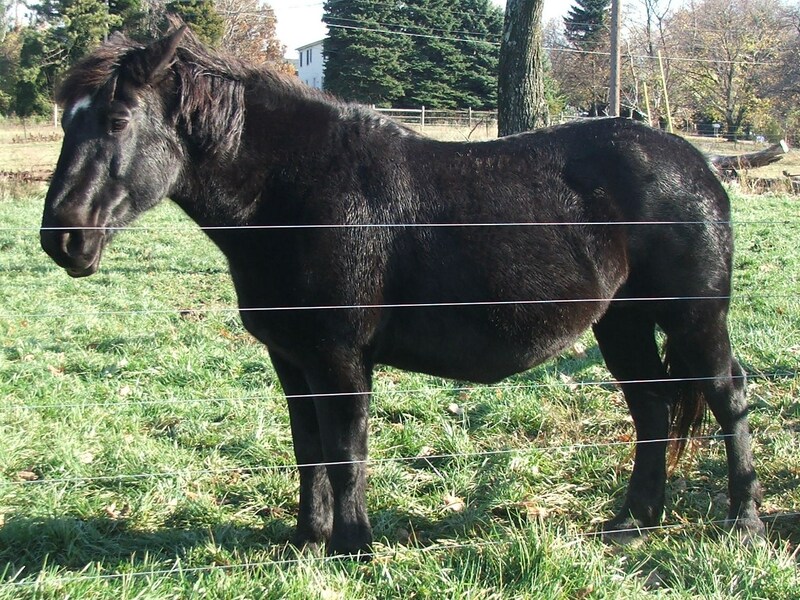 She was weakened to the point that her hind end failed her. Her spirit and her mind remained very much alive as she continued to eat all the grain offered to her. But attempts to stand exhausted her and she frequently layed back down breathless and grunting. It is so hard to know when it is time to say good bye – so hard when the mind serves but the body fails. Oaka’s eyes, clouded in blindness, looked tired. I could not read her intentions well, but saw that she was so tired, so lame, her spirit confined to a body that could not see, stand or move as I am sure her indomitable spirit wanted to. Finally, after waiting patiently for us to “know when,” our vet set Oaka’s spirit free. Her cloudy eyes remained open when she passed – but they softened when, as I can only hope, her pain, anxiety and fear slipped away with her last breath. After leaving the stall, I saw that the morning had morphed into the most beautiful day of the year, to date. I was very sad that Oaka did not have the opportunity to experience this first true day of spring. When it came time for Oaka to be taken off the farm, I watched as the two horses and donkey in the front paddock stood solemnly, quietly and watched Oaka leave with a new spring daffodil tucked into her halter. The horses and donkey stood perfectly still, shoulder to shoulder, in full calm attention – a solemn farewell to their couragous friend. When Oaka was finally gone – the three, all together began grazing, quietly, in unison. Living in the moment, these three accepted the rythms of the farm – where life goes on.